We know we need to feel loved and valued. Children need that as well whether they are in school, home or in the community. But maybe there is more we can provide for the children in our lives. These might be children, grandchildren, neighbor kids, or students you are teaching. I have always loved teaching~ my 30 years of teaching is full of exceptional memories, some great and some difficult. I taught many grades, but I found I was most effective and comfortable with young children. I did learn to appreciate the more mature thinking of middle school and high school students as I spent time with them in various eco-systems in Peru, Costa Rica and Africa. I began to realize there were some very common learning traits in children of any age, and adults as well. Following my NDE, as you have read in my stories, LOVE, joy, peace and calm is what I experienced as I watched my lifeless body. And being engulfed in white light put those concepts into my body as a knowing of what life is all about. I learned so much from God during this journey. It took me years to process it all. But, I could always “feel” that unconditional love in my body and soul. Look at what kind of ENVIRONMENT I had for optimal learning! I had a bright tunnel full of Light and Love. As teachers we needed knowledge in how to set up and maintain warm inviting places for learning. What did I learn then that is significant for education? There is NO FEAR – Can we reproduce that in a classroom? I had purpose in coming back – I felt totally valued as a person. Will the child feel worthwhile and valued in our schools? PEACE was only a thought away – I just needed to access it and SILENCE my dominating left-brain. Do we give children time to access silence privately with their own thoughts during their day? We are all CONNECTED – Can we help children accept differences with tolerance? Education is my life’s work. Over the years, I began to realize I was using all of these concepts in my teaching without really understanding where the wisdom had come from. In the years after my NDE, I never could understand why administrators and teachers would use heavy punishment for kids. Shaming them was a concept I couldn’t even wrap my head around. Teaching respect for all children and for all teachers in their school environment is absolutely essential! It has always been an essential part of my teaching. Keeping the environment lively, stimulating, and caring was top priority. In my classroom, teaching of reading in K and 1st grade is a priority of course. But I also realized ALL of the traits listed above needed to be in place for my students before learning tough things like “HOW TO READ” were going to happen. But, I didn’t just want them to learn to read; I wanted them to LOVE reading! I realize I was very successful teaching reading. This is not meant as an ego statement, just sharing. My masters credits were spent learning the latest techniques for teaching reading and delving into the new insights related to the brain . This made a difference of course. But, I could teach any child to read, even emotionally challenged students or learning challenged students. I had adopted some helpful practices without really thinking about why until later in my teaching career. Feeling worthwhile, loved and valued brought greater learning into their lives. Feeling no fear allowed them to relax and slow their own metabolism. But I needed one- on-one TIME with so many of the children I was teaching. Many were from dysfunctional or busy working families with little extra time. Too many lived in fear of isolation, hunger or violence. They needed caring love and they needed a loving touch in their learning day. I had figured out if I moved an anxious, struggling reader right beside me, I could transfer love energy to the child by putting them into my own energy field. Hugs were huge. For those who feared touch, they only needed to be right by me to feel it. I was able to have a group of 5 – 6 children around me learning reading techniques and practicing their skills with others right in front of me, so I could continue to keep an especially needy child right in my energy space. By simply moving that struggling reader next to me while others kept reading, I could calm and teach that child. I could feel when their body relaxed enough for the learning to take place. But, I had to have calm caring thoughts about this child for the energy to emerge in my own body. In my NDE, I had been gifted with a huge sense of calm. This is NOT easy with very difficult and demanding children. “Daily” exposure to that type of learning brought successes to children “starving” to read. They needed to hear me saying to them individually how WELL they were reading, how TALENTED they were, how much PROGRESS they were making. Then I wrote this down for them. I AM Doug and I like to read. I AM now reading 20, 30, 40… words. I AM now reading my book myself. I made these into books for them to read and take home to read. They drew and illustrated them. Some read to Mom and Dad, some to a grandparent, some to an older brother or sister. Some read to a dog or cat because they give them love every day. Some read to a stuffed animal because there was no one else. But, they learned to read over time. I knew that every child that came into my classroom for so many years had been born with the same inner soul that I have. Speaking the words I AM…words that mean God, help children believe in themselves and help them realize they can BE anything they want to BE. This kind of education is as important as the “basics.” It is basic. Teaching inner strength is so important. Just think what happens when a child says; I am ugly or I am stupid? It’s a sad thought that we could come up with a string of 20 or more negative words kids hear and then say to themselves starting with the words I am. Not many classroom teachers have the TIME to spend teaching one on one with all of the pressures and demands required of them today. Watch our BLOG for thoughts on this!! What is this pressure doing to kids? What is it doing to our talented teachers trying so hard to meet the expectations from administrators, but also care about the wholeness of their students? See our Resource section on Children & Adults for details! A classroom is full of interesting manipulatives, often to be used for math lessons. Manipulatives can be defined as “something to think with.” It can provide a concrete picture of a concept that is more abstract. In my first grade classroom, we had a time each day called Choosing Time. The children could choose anything to use within the planned learning environment. The classroom environment was planned to contain items useful for the current curriculum. 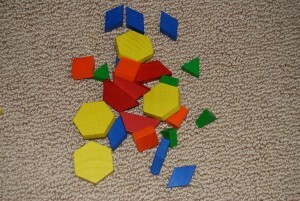 One of the manipulatives on the math shelf was a large box of Pattern Blocks. 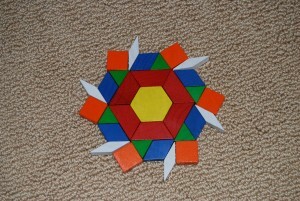 During this Choosing Time the children loved to make beautiful patterns with the Pattern Blocks. As the design grew on the rug, other children would join the child building. They were drawn to the activity by the excitement of a colorful repeating pattern growing on the floor in front of them. One day the Pattern Blocks were spontaneously repurposed. After this first day, this became a tool used fairly often, sometimes at the children’s request. This particular day, the children came in from recess all riled up. The children picked up their writing journals and sat down to work as they were supposed to, but little angry conversations kept erupting. Very little writing was getting done. 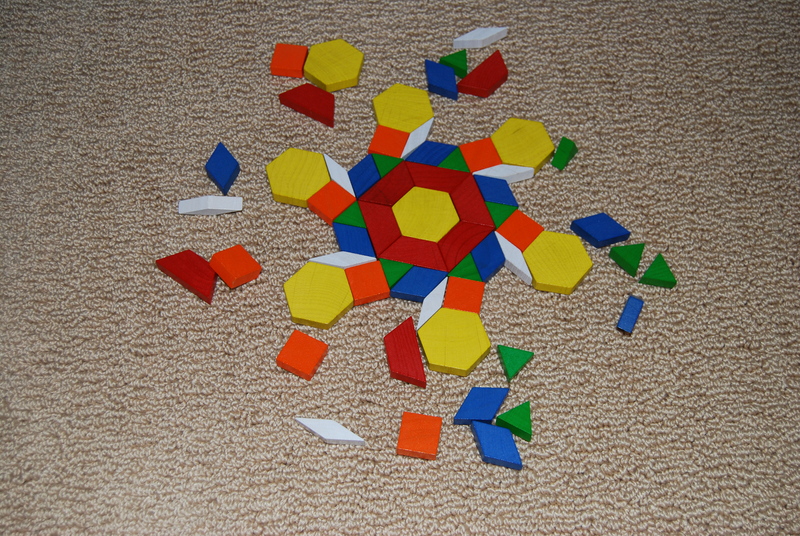 I grabbed the Pattern Blocks and called the children to the rug. First I built a small, beautiful symmetrical pattern. Next, I took a handful of the blocks and put them down in a scattered pile. “Which design looks like you would like our classroom to feel? We soon got to the bottom of the issues and how the children were feeling about each other. The Pattern Blocks provided the concrete picture of a more abstract idea – that of community dynamics. The conversation that ensued was very rich. I directed them to talk to the group, and as they talked, they continuously pointed to the blocks. Why is this work important and worth the time it takes? You are teaching to current and age-old wisdom. It needs to be taught in context. There is an intuitive “knowing” inside all humans. All the children agreed. It feels better when they can talk about what is bothering them. They also could feel the difference within them as the community began to reform – re-form. What you face will erase. What you resist will persist. Neale Donald Walsh talks about this in his books Conversations with God. The children would have kept their anger going and it would have again erupted at lunchtime. Spiritual leaders are saying that internal, unattended negative emotions keep us in “ fight or flight” mood and can contribute to illness. The children faced their community problem and came up with solutions. They were practicing with a real life situation. Feelings are the language of the soul. Parker Palmer in his book A Hidden Wholeness talks about keeping role and soul together. Often in teaching and other jobs, we leave our “inner knowing” at the door as we go through our workday. We are diminished by this, and often loose track of why we choose our work in the first place. We experience sadness and burnout. CHILDREN can experience the same thing if their education is only driven by mandated curriculum and testing demands. We are human beings – we need to BE, not just DO. We all need to experience and give: love, respect, nurturance, compassion, empathy, and forgiveness. I asked him to show us. 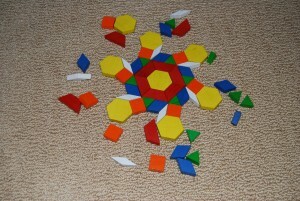 He picked up some of the blocks and scattered them on the outside of the beautiful design I had built. Others joined in and the discussion was deepened once again. 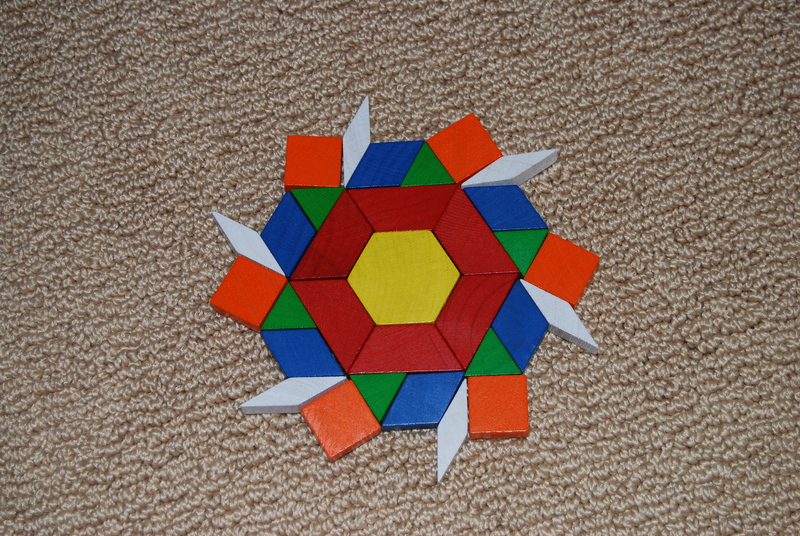 The children were drawn to this Pattern Block activity by the excitement of feeling in control, of the skills they were learning by the repeating pattern of growth within them, as such activities were repeated. It could be said… that one way education can be measured is by the “identity and integrity” the children have learned and display as they come out of our educational system.